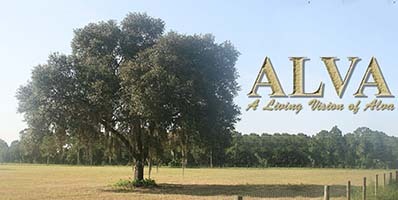 Welcome to the Home Page of ALVA, Inc.
ALVA's mission is to preserve and protect the unique historical, rural, agricultural and equestrian ambiance of Alva, Florida. Membership is open to any Alva resident, property owner, or business that is interested in the future of this area. Alva is the oldest settlement in Lee County. It has a unique country flavor that is rapidly becoming hard to find in Florida. From the magnificent sunsets over the Caloosahatchee River to the majestic oaks draping their moss-laden limbs over the center of the village near the banks of the river, this is Alva, our home. Southwest Florida is experiencing extremely rapid development. It will take a concerted effort to ensure that the growth occurs in a manner that maintains the character and flavor of this area. We realize that growth will occur. We aim to work together to ensure that Alva remains a place that we want to live in and call home. © ALVA, Inc., all rights reserved. If you have questions, concerns, or comments about ALVA, please contact an ALVA board member.